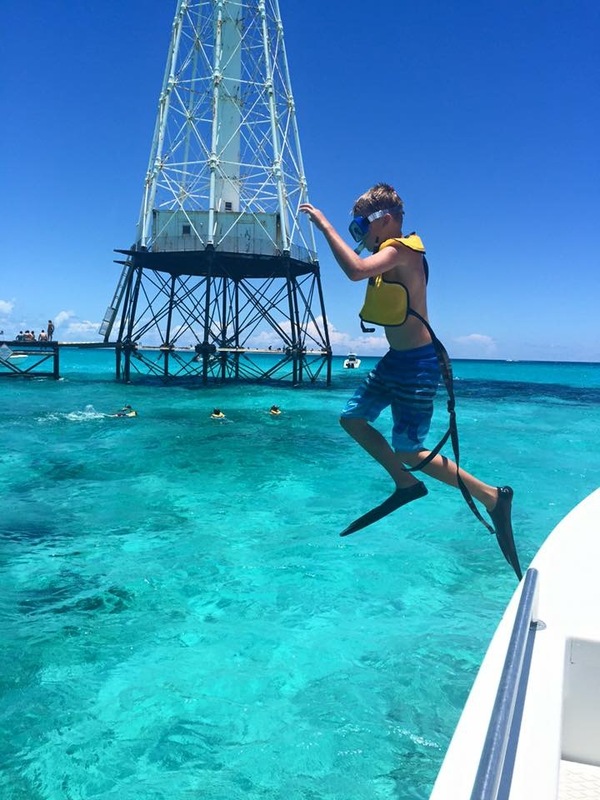 This family resort, located in the center part of the Keys on Duck Key, has activities and amenities for every age group which is hard to do when you have selfie taking teens and toddlers learning to swim. At the heart of the resort is a saltwater lagoon, fed by the ocean but cleverly filtered of dangerous sea creatures. Those weary of ocean life will feel very comfortable knowing nothing harmful will be lurking near their family. Around the perimeter of the lagoon, there’s a white sand lounge area where you can choose to lay out, order lunch or rent stand up paddle boards or kayaks. There are daily activities at the lagoon like parent-child paddle board races where my daughter and I beat a handful of dads one year. There are "mermaid" swims during the day, water balloon tosses in the afternoon and smores making by the firepit at night. There's also a fitness center with daily yoga classes and a spa if you can break away for a few hours. Hawks Cay is a great place to come with a big group or just your immediate family. With waterfront villas where you can park your boat, hotel rooms to villas with pools (our choice), there is an accommodation perfect for your need. Although we can walk to the main lagoon and resort area, there is a shuttle that we sometimes hop on and off on depending on how many tired swimmers we have that day. With so many activities to choose from, you can have a different experience at the resort every day. My little ones LOVE the pirate ship pool area that is great for non-swimmers and toddlers. There’s an adjacent playground, turf soccer field, basketball area and grill if you want to set up camp there for the day. There’s a Kids Club with daily activities and drop off hours for when parents need a few kid-free hours. There are bikes to rent, tennis courts and plenty of pools around the property if teens want to spread their wings a bit but still be in the vicinity. There’s also a dolphin training area where you can have dolphin encounters or simply watch them interact and play. My toddlers' favorite place to be! Although I have vacationed in the Keys since I was a teenager, the main reason I come is for our annual mother and son fishing trips. I started this tradition when my son was eight years old and at 13, is something we both look forward to every year. It's a nice break from his five sisters, diapers and tears. We have used the same back country guide, Ted Wilson, for years who is based out of Bud N Mary's Marina in Islamorada. He is a University of Florida grad and a father who really goes the extra mile to ensure my son catches something cool enough to impress his friends. I'm writing this after another successful day of fishing where we caught three tarpon, a 7 foot hammerhead and several other small sharks. After spotting some dolphins today, Ted got close enough to them to entice them with his boat wake. We were fortunate enough to see the dolphins get next to the boat and jump in and out of the waves. (I posted this on my Instagram - JennyReimold.) We have previously caught snook, trout, lemon sharks and even a sawshark before. Not only is he a great guide, but with an Animal Science degree, Ted really teaches my son a lot about marine life and shows him the importance of protecting the ocean by picking up trash and cutting line tangled in the environment. If you want to book Ted, contact him here. One of my other favorite places is Robbie's on Islamorada. Here you can hand feed the world famous tarpon that have been coming back to these docks for nearly 20 years. Robbie and his wife, Mona, rehabilitated a lone, injured tarpon, Scarface, and released him back into the wild 18 years ago. Each year Scarface returned and came with a few friends each time. Now there are hundreds of tarpon that live around the marina and feed off the dead fish tourists toss to them. Additionally, Robbie's is home to our favorite snorkeling boat, The Happy Cat. For $39, you get an almost three-hour trip to a few local reefs including Alligator Reef which has a beautiful lighthouse in the middle of the turquoise blue waters. Hand feeding tarpon at Robbie's. Jumping off The Happy Cat into Alligator Reef. Hawk’s Cay is just about an hour’s drive to Key West where I always take the kids for a day. I’ve been to the Keys enough times in my life to know that Key West, although great for adults, couples and college-aged kids, is more of a one-day experience for our family than a week long trip. Ernest Hemingway’s house offers a great historical tour along with an introduction to his seven-toed cats. Little known fact that Kelly’s Restaurant is Kelly McGillis’ from Top Gun. The Southernmost Point landmark is a great photo opportunity but you’ll most likely wait in a long line and have trouble finding parking. Sunsets in Mallory Square offer a variety of performers and local artisans. Our victorious mother-daughter paddleboard race.